Great food, great drink for an even greater cause. In America more than 17 million children struggle with hunger. That is close to one in four children. For 28 years Second Harvest Food Bank has helped feed the hungry in Central Florida. With the help of the food industry and the community, millions of pounds of wholesome food is distributed each year to 500 local feeding programs. Yet in today's economy the need continues to grow. 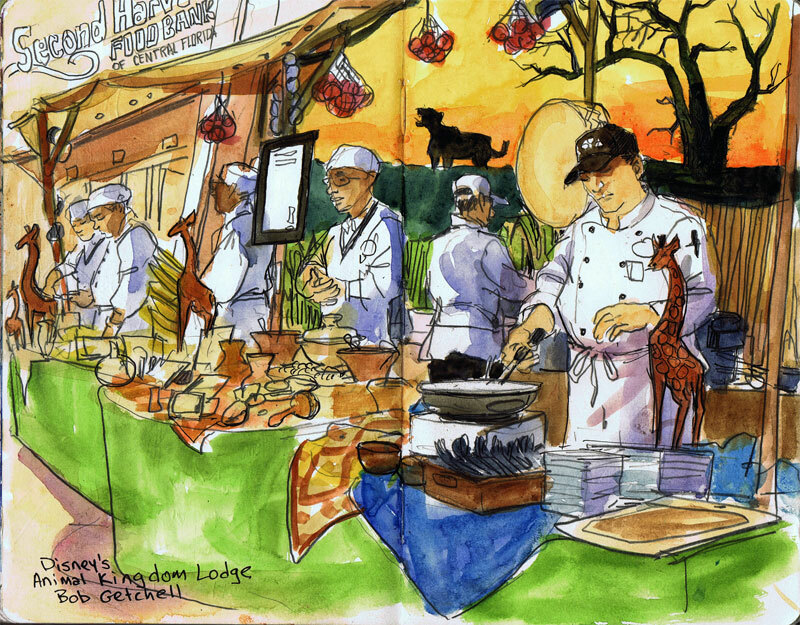 Taste of the Nation was held at the Orlando World Center Marriott (8701 World Center Drive). Terry and I arrived a little early so I could get started on a sketch before the event got too crowded. More than 2000 people were expected to attend. We bumped into Paula Large who is an excellent artist. Paula's husband was working the event as a chef on stilts. I saw Maria Diestro, who is the Second Harvest Communications Manager. She had invited me to sketch and report on the event. While Terry went to shop for reading glasses, Maria walked me into the ballroom. The room was immense. All the vendors had donated their time and food to the cause. Maria said I had to the Royal Plaza table to try Chef Jean Louis's famous bananas foster. This was the first place I stopped. Jean Louis put butter in the frying pan and the banana halves sizzled. He then drizzled something in the pan which lit up causing a fire ball. Oddly Jean had no eyelashes. Sure enough the bananas foster was fabulous! I was content and fired up to start sketching. Walking the room I was attracted to the orange African sunset behind Sanaa at Disney's Animal Kingdom Lodge. Chef Bob Getchell was preparing the spicy Durban Chicken. He demonstrated to everyone working the event how much food should be served. The dish had to look good as well as taste good. The spicy Durban chicken was served on a bed of Basmati rice with mint chutney and papadam. The dish was a little to hot for my taste. I wished I had a beer to cut the spices. After I finished my sketch, I texted Terry and we found one another in the cavernous room. She had been sampling dishes while I sketched. She introduced me to the dishes she liked the most. A wild Boar soft taco was delicious as was a sweet pork belly. I was thirsty from the salty meat dishes so I searched for water or a soda. I couldn't find either one so I settled on a white wine. Seating was only available in the VIP area which was roped off. After an hour of standing I was getting tired. I can't imagine how the women standing in their high heals managed. When Terry wandered off in search of more food, I sat on my camping chair. A chef walked by and, pointing to his temple he said, "You were smart to bring your own chair." There was a chef throw-down competition on the main stage. The competition only lasted 10 minutes so I didn't try and sketch. 150 Keys were being sold for $25. One of those keys would open a door to a wine cellar containing thousands of dollars worth of wine. At the end of the evening a long line of people gathered to try their luck at unlocking the door. It only took five attempts before a woman's key worked. She shouted in delight. Taste of the Nation Orlando raised $167,500 to fight hunger in Central Florida that night.